SKIOLD supplies complete climate solutions for pig farms. We strive to be in the forefront and develop our own systems in close cooperation with experts and farmers. The climate in a pig house should be good for your animals and your staff, and also for your operating efficiency and the environment. Therefore SKIOLD works continuously to minimize energy consumption and optimize reliability for all our climate systems. SKIOLD is a total supplier of ventilation for your pig house; negative pressure, equal pressure, diffuse pressure, combi-diffuse as well as tunnel ventilation. Negative pressure ventilation is the most common choice of ventilation principle among SKIOLD's customers. 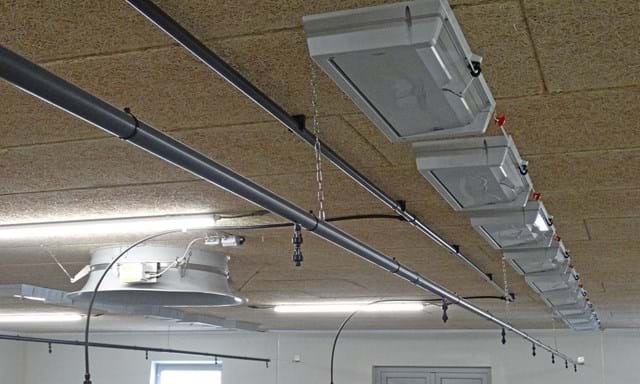 This type of ventilation consist of a certain number of exhaust chimneys which are mounted in the ceiling or roof. Air intake is enabled by use of either wall or ceiling inlets. Being able to deliver an operational reliable ventilation system which also minimizes the cost for energy remains one of SKIOLD's greatest priorities. A wide range of components for air intake, control and exhaustion enables SKIOLD to design an energy-efficient ventilation plant which complies with practically all demands. The SKIOLD PM (Permanent Magnet) motor is the new generation of low energy motors for ventilation. SKIOLD PM motors reduce the energy consumption by 35% to 70% compared to traditional triac or frequency controlled motors. For pig farms in tropical areas, we use tunnel ventilation, which secures the same air speed and the same cooling effect and growth rate in the whole house. The green stripe pad consists of specially impregnated and corrugated cellulose paper sheets with different flute angles that have been bonded together. This unique design yields a cooling pad with high evaporation efficiency while still operating at a very low pressure drop. The only things you do not need in your pig house are draught, cold and wet areas, sultry and humid air. SKIOLD Heating systems ensure optimum growth conditions for your pigs, because you can control the indoor climate also when it is very cold outside. All SKIOLD heat installations are carefully balanced to correspond to your ventilation system and the type and size of buildings. This will minimize installation and energy costs, but most important of all: You will get full benefit from your investment because it will work like intended. During winter it can be impossible to run the ventilation system low enough to keep the temperature up without negative effects on the air quality. Typically the air will become dense and humid and very unpleasant for staff and animals. By installing room heating it is possible to change enough air in the section to maintain a good air quality and still keep the indoor temperature on the set point. Furthermore the hot air from the fin tubes will lift the cold air from the air intakes and "carry it". This effect prevents draft inside the pig house. A small pig has a relatively bigger surface compared to its bodyweight than a large pig. This means that it looses relatively more heat to the surroundings. The more energy a pig needs to maintain its body temperature, the less energy available for the pig to grow and fight stress or disease. Piglets and weaners shall never keep the concrete floor warm - but the other way around! SKIOLD fin tubes are specially developed for room heating installations in pig farms. The design of the fin tubes is optimized for the largest possible heating surface and galvanized to match the indoor climate conditions. Professional tests have found that fin tubes from SKIOLD produce up to 80% more heat energy than other existing brands on the market. In other words: You can save many meters of heating tubes by choosing a fin tube from SKIOLD. SKIOLDS heating systems are made up of high-end quality products. GRUNDFOS pumps and Danfoss thermostats are standard. All valves are calibrated for maximum regulation precision. Shunts can be reversed. Contrary to traditional "low-pressure equipment" the water comes at high pressure, approximately 70 bars. The patented nozzle system from SKIOLD ensures an extremely fine vaporization of water. In this way water is prevented from dripping onto the animals or pens since the water will evaporate in the air before falling down in the animal zone. Evaporation requires energy which is taken from the air in the pig house. In this way the cooling effect is obtained. The water consumption is very low - max 5 grams of water per cubic meter ventilated air. The SKIOLD EVAPOCOOL system is regulated by the VisioVent eller VisioVent XL climate control. A built-in stop for maximum humidity prevents overdosing. Animals and equipment must not become wet and the air inside the pig house must not be humid or sultry. The intelligent regulation of the cooling is adjusted gradually in relation to the demand. In this way the most appropriate cooling effect is obtained without big fluctuation of temperature and humidity. SKIOLD EVAPOCOOL can also be used for soaking in connection with cleaning. Pigs are non-sweating animals and are therefore easily affected by high temperatures. Thus it is very important that the pigs can be cooled - either by dunging themselves or being sprinkled with water by a sprinkling system. By sprinkling the dunging area with certain intervals the pigs are encouraged to dung in the dunging area instead of the lying area. Hereby the sprinkling system is used to control the pigs' natural behavior and improves the hygienic state of the pig pens. Sprinkling has a good effect on the well-being of the pigs releasing them from heat stress and not at least reducing the ammonia odors due to less dunging in the lying area. 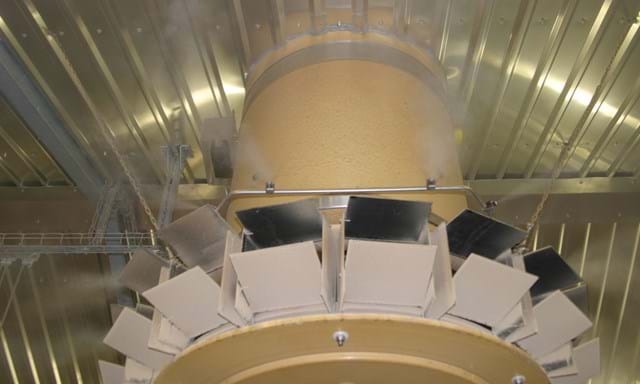 The sprinkling system is controlled by a SKIOLD climatic control (VisioVent eller VisioVent XL). A solenoid valve automatically turns the water on/off depending on outdoor temperature and/or preset time intervals. The water pipes are connected to the water mains and sprinkle in the dunging area by non-return sprinkling nozzles. In pig houses without climatic control function for sprinkling, a thermostat (T-41) and a solenoid valve with time interval for stop/start at a set temperature can be installed. By installing an extra water pipeline in the stable it is possible to soak the pens to facilitate the cleaning procedure. The nozzles in the water pipe sprinkle the water in a horisontal angle of 360° soaking all the surface with water. After a few hours of soaking, cleaning is much easier. Start and stop of the soaking process is done by a manually operated ball valve installed on the water pipe.